If comprehensive analysis of relevant individual statistics from the 1939 NCAA football season, itself, is somehow not enough to make a complete mockery of KENNY WASHINGTON’s failure to secure Consensus First Team All-America status as a senior then, surely, a thorough review of the performance from the UCLA Bruins star left halfback against the defending National Football League champion Green Bay Packers at the memorable 1940 College All-Star Game in Chicago certainly would validate Washington’s worthiness of such honors. As had been the tradition since the inception of the College All-Star Game in 1934, the starting XI for the collegiate team to be battling the Packers in late August of 1940 was based on balloting conducted by The Chicago Tribune and 391 other newspapers and radio stations across the country all working in conjunction. More than six and a half million people participated in the College All-Star election held in July that year and, especially considering the fact that three of the four official Consensus First Team All-America backfield players in 1939 were underclassmen, it remains interesting to analyze the results of the voting decades later. Not the least bit surprisingly, “triple-threat” left halfback Nile Kinnick of the Iowa Hawkeyes, the current Heisman Trophy winner and Consensus First Team All-America choice in 1939, was an overwhelming selection of the fans to occupy one of the starting slots in the All-Stars backfield having collected almost 1.2 million votes. The other three players nominated to be in the All-Stars’ starting backfield alongside Kinnick, with perhaps one exception, must have raised more than a few eyebrows throughout the nation. At least USC quarterback Ambrose Schindler had been lauded as the Most Valuable Player of the 1940 Rose Bowl Game after rushing for one touchdown and throwing for another six points during the Trojans’ 14-0 impressive shutout of the previously unbeaten and untied Tennessee Volunteers on New Year’s Day. But Purdue Boilermakers right halfback Lou Brock, as was the case with Schindler, had not been recognized as either First, Second or Third Team All-America in 1939 by any of the fifteen major accredited organizations carefully studied by this blog previously (see, “The Multitude Of All-America Backfields In 1939”). The election of fullback Joe Thesing from the University of Notre Dame, who received the second-highest number of votes (981,276) out of all the All-Stars’ players in 1940, was a most curious decision, indeed. Although it was the senior Thesing who had nominally started seven of Notre Dame’s nine NCAA games in 1939, it was junior fullback Milt Piepul who had been rewarded with Second Team All-America status by the Associated Press after leading the Fighting Irish with both 414 yards rushing (5.0 avg) and six touchdowns scored that season. Surely, it was Notre Dame’s national popularity at this particular point in time that had as much to do with the voting results as did Thesing’s talent. The 1940 College All-Stars official starting XI as voted for by football fans all across the nation line-up for a press photo under the lights at Soldier Field in Chicago. 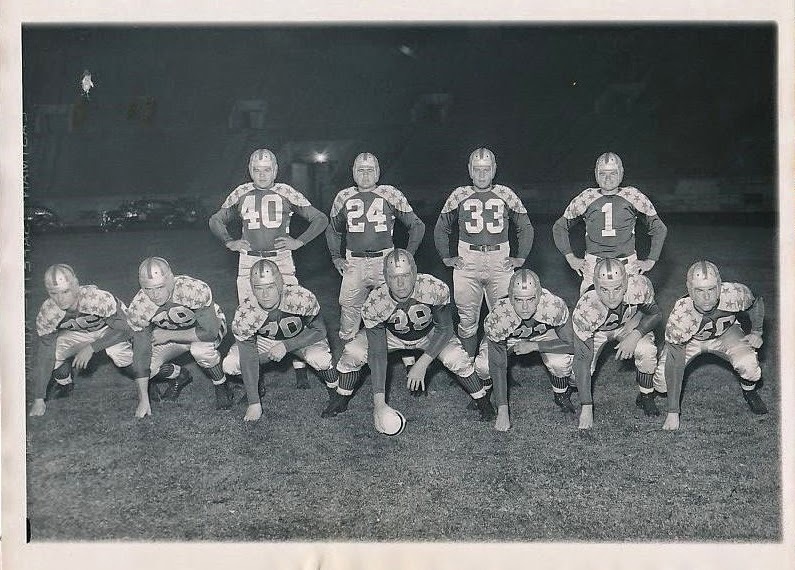 In the starting backfield, from left to right, are : Purdue right halfback Lou Brock (# 40), USC quarterback Ambrose Schindler (# 24), Notre Dame fullback Joe Thesing (# 33) and Iowa left halfback Nile Kinnick (# 1). And up front at the line of scrimmage, from left to right, are : Ohio State right end Esa Sarkkinen (# 25), Notre Dame right tackle Tad Harvey (# 69), USC right guard Harry Smith (# 70), Hardin-Simmons center Clyde Turner (# 38), Indiana left guard Jim Logan (# 71), Northwestern left tackle Nick Cutlich (# 64) and USC left end Bill Fisk (# 50). Fortunately for the sake of the College All-Stars’ chances in a game against the defending National Football League champions, the All-Stars coaches (who were always chosen after the balloting for the starting line-up had been completed) were under no obligation to leave any starting player(s) in the contest for any certain length of time after the opening kickoff. In all reality, the vote to determine the starting XI for the College All-Stars was a ceremonial affair — actual playing time in the 1940 contest against the Packers, itself, would be decided on the practice field during the All-Stars’ eighteen-day training camp in August.